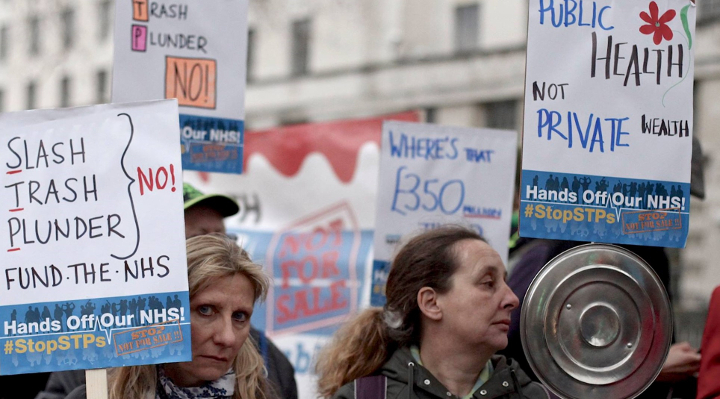 The NHS is not ‘in debt’: – it has suffered deliberate de-funding since 2010 and it cannot provide safe care without ‘overspending’. The context includes severe cuts to the Public Health and social care budgets. The NHS is tasked by 2020/21 to have absorbed an annual equivalent of £22b of health service cost pressures. Nationally, Sustainability & Transformation Plans (STPs) have been created to implement these cuts, and to impose new cheaper models of practice in a fractured, weakened health service. England has been divided into 44 Footprint areas – an STP for each. Under great pressure and secrecy, each area has been ordered to create an STP with the financial driver centre stage to ‘balance the books’ by 2020. Simon Stevens put forward the Five Year Forward View as the template for realising this impossible ask. But he highlighted specific caveats which if ignored would prevent his deliverance of FYFV and £22b savings. Most important was the requirement that adequate funding of social care be maintained. However, severe cuts in local authority funding have resulted in over 30% reduction in adult social care budgets with more to come. There is a national crisis. One million elderly people nationally no longer receive the personal care they need from social services. Keep Our NHS Public believes strongly in the provision of high quality community based health and social care where our local district general hospitals are part of the network of community provision. Excellent, safe and accessible hospital care is an essential component of a safe health system. The UK does not have enough hospital beds, hospital doctors, nurses, therapists or GPs. KONP rejects NHS England’s strategy of imposing financially driven STPs because they are a vehicle to drive through the financial cuts, they are threatening 1000s of NHS jobs, they plan closures of A&Es across England and mergers of numerous maternity units and there is no viable financial plan that will pay for the community based care that is supposed to be replacing the need for tens of thousands of hospital beds. The STPs also provide a cover for new organisational forms – multi-specialty community providers (MCPs) and accountable care organisations (ACOs) – at different stages of development in different areas. The tendering process for these contracts will place yet more of the NHS at risk of going to private contractors. We are exposing this deceit and are campaigning with Health Campaigns Together to stop these STPs. Read more here – a FAQs document by Carol Ackroyd (Word). The KONP information pack on how to take the campaign further is available here (Word). Go to Health Campaigns Together’s STP Watch for national information on all 44 STPs and for the great STP pack.